In the first post in this series we set the goal of using motion vectors of the continents to analyze the forces exerted on them, and described the motions of Africa and South America. 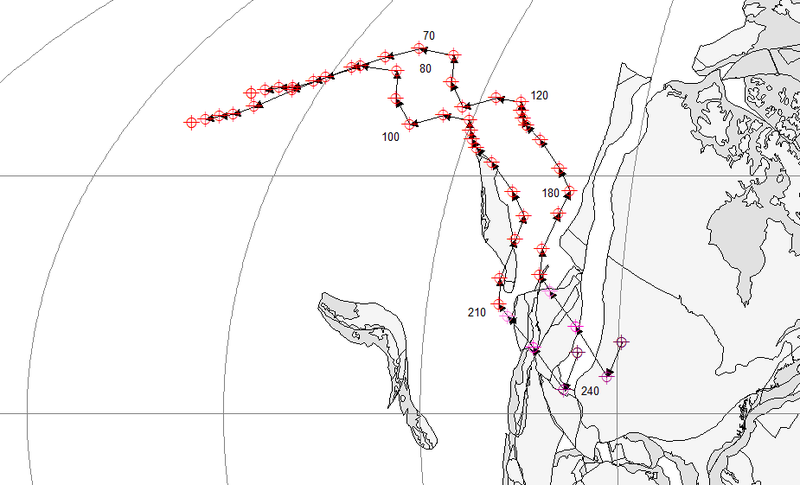 In the second post we described the odd circuit travelled by Antarctica and Australia. Eurasia travelled in a tightening circular path until 100mya. It then took a sudden nearly reversing 20 million year excursion to the southeast, before resuming its seemingly ordained tight arc to the present position. The points chosen were plate vertices on the Asian side of the suture zone that unified Europe and Asia. This zone was active in the Paleozoic, but the unification was complete before 250mya. The dates of some major inflection points are noted. 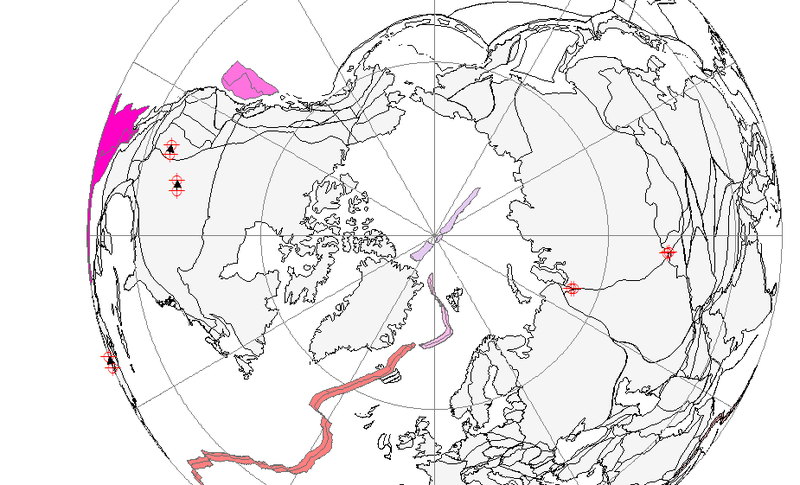 At 250mya, Eurasia was oriented substantially north-south, and the differences in the paths of the currently more northern and southern points, respectively, reflect the rotation to the current east-west orientation. It can be seen above that Eurasia hasn’t ventured much since 250mya and most of its motion is a net rotation of about 90 degrees clockwise. This rotation must have caused shear between Eurasia and North America/Greenland. Indeed, Roberts and Lippard (2005), Redfield et al 2004, and Andersen et al (1999) find evidence of strike faulting in the Caledonian corridor. North America has always shown a wanderlust. It is the oldest Craton. 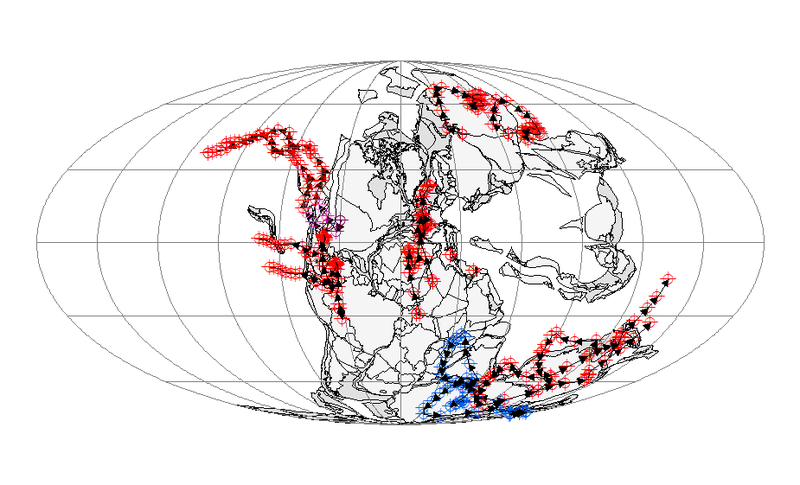 We are skeptical of reconstructions deeper in time than this study, except in the broadest sense, but many reconstructions show North America as the first craton to leave the fold the late Precambrian supercontinent of Rodinia. Perhaps we should not be surprised that North America was the first continent to leave Pangea. Its wander path was unique, following neither the north then south about face of Africa and South America before their split, nor the circuit and rotation of Antarctica and Australia, nor the extreme rotation of Eurasia. After an excursion to the southwest at 240mya (consistent with a pattern of anomalous 250-240mya motions), North America meandered northwest with significant inflection points at 210 and 180mya. Like Eurasia, North America took an excursion from 120 to 100mya before seemingly resuming its prior meander. At 80mya, the meandering years ended. 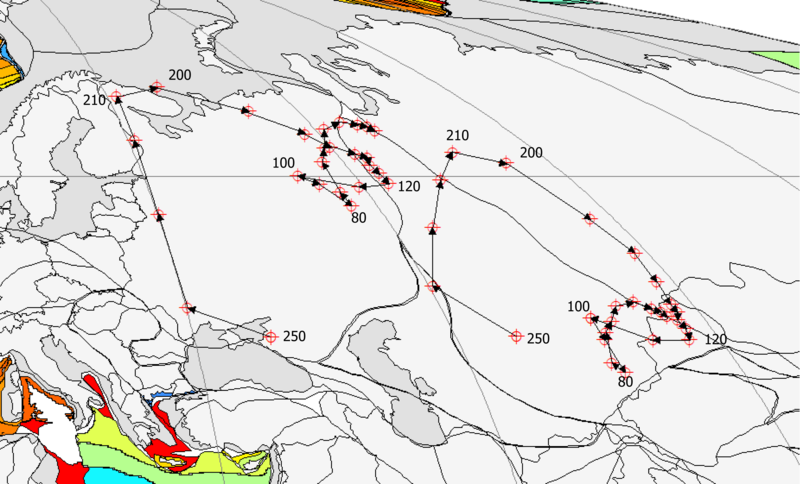 From 80 to 70mya North America headed nearly due west from its former northerly meander, and since 70mya North America set a WSW beeline to its current location. We have described the wander paths of our six cratons. In the next post, we will bear down on constraints. Gymnosperm, I remember a comment of Bill Illis at WUWT that Greenland would migrate another 200 km northward, somewhere in the future. Do you have indications in your data that that is correct? And what about the northern continents, what are they supposed to do? Let’s say between now and 25 million years. Hi Wim, I really don’t know. Christopher Scotese has made predictions like that. You can see them on his websites. I’m still working on this, but above is a polar view of the ocean floor production 10mya to present. My eye sees no reason Greenland should move north. Eurasia is moving away to the SE. North America (to which Greenland seems bonded since there is no production on the apparently “failed arm” of ridge separating Greenland from North America) is moving away to the SW. Thanks Gymnosperm. I am following your posts.